Scalable and flexible mobile communication platform on "22 x 23 mm": The mobile communication form factor of the future! Strong brands combined with RED SUPPORT! GLYN provides you with access to more than 35 years of expert knowledge in the area of industrial storage solutions! From DRAM via SRAM to Flash media - We have arranged our portfolio with strong brands for durable and safe storage solutions for industry. Future-compatible with the storage requirements of the "Internet of Things". 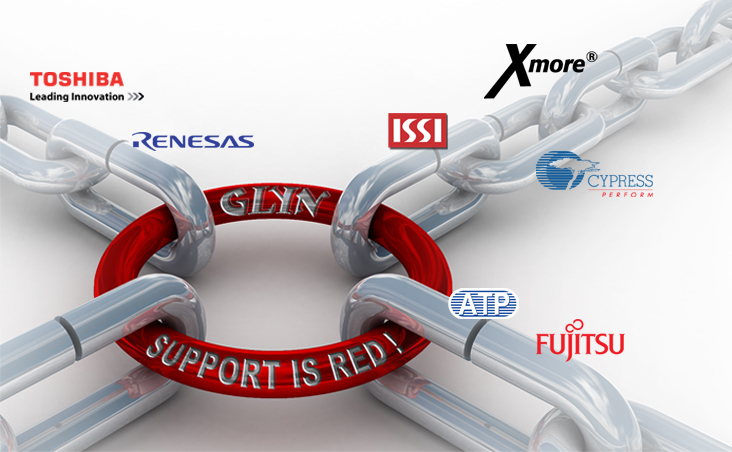 Together with these manufacturers, GLYN creates an important link to your industrial storage concepts. For long-term availability, up to 15 years, reliability in extreme temperature ranges and safe and future-orientated technologies. Here you can get full support for your ideas, concepts and requirements.